Congratulations on your decision to formalize your relationship. Studies show that married people are happier and live longer, so you're on the right track. First, allow yourself enough time to think through and understand all the new information that you will be involved with in your search for the perfect diamond ring. One of your first decisions will be to decide whether to surprise her with a ring or shop together. That will depend on your relationship. There are advantages and disadvantages in each case. A good middle ground and one that will keep you in budget is to let her pick out the engagement ring mounting and you come back to select the diamond. The most important thing is to make the occasion a romantic one to remember. There are many factors to consider: the shape of the diamond, the size versus quality of the diamond, deciding on white gold or platinum or yellow gold or a combination of the two. 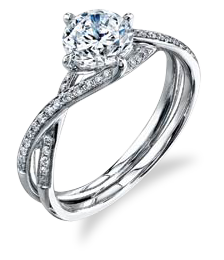 Knowing her style will help you to determine a ring that has a contemporary look or one that is more traditional. You can get some good advice from friends and family as well. Matching a ring that fits her lifestyle is the key. Comfort and practicality is always part of a good decision too. In most cases you need only get the engagement ring and not the wedding bands at the same time. This will save you an additional expense and allow for both of you to choose together, often times having her contribute to your wedding band purchase. 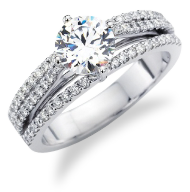 Wedding bands can be purchased 60 to 90 days beforehand depending on if they need to be ordered, engraved or sized. Another decision will be her wedding gift, usually presented the morning of the wedding to help commemorate that special day and set the marriage off on the right foot. Traditionally it calls for a pearl necklace, although a choice piece of jewelry will serve as a lasting remembrance. The most important decision is choosing a good jeweler, one you feel comfortable with and who is willing to make a commitment to establishing a long-term relationship with you, your family and friends. A lasting relationship you can count on year after year. A good jeweler will help you every step of the way, without pressure, providing professional expertise and knowledge in your decision-making. Providing patient, personalized attention with a no nonsense approach and an enduring commitment to the highest level of ethics and integrity is what you should look for. Kenneth Gordon takes great pride in always being available for consultation. "A complete dedication to my clientele is the hallmark of my business." "My passion is jewelry. My policy is simple, I do whatever it takes to please." "I love what I do, and thanks to you, I'm going to keep on doing it."